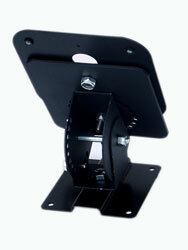 Adjustable locking base for Golight Radioray Remote Controlled Spotlight. A spring loaded Pem stud snaps into one of the numerous index holes, controlling the rotation and tilt angles. Although the angle is easy to change, no amount of vibration will change the settings, once established. Obviously, the remote control lights can change rotation and angle, but often times the remote control light needs to be elevated in order to have full range. Sometimes, the remote control light cannot be mounted at the very edge of the surface or it is mounted behind some type or rail. In these cases, elevating the light 6 inches and creating new angles will improve the performance of the light. For people wanting to mount the Golights on an angled surface, this adjustable, locking base seems to be working well. It gets the Golight up about 6 inches from the mounting surface and gives them the ability to set the mount angle and rotation at any angle they like. You just pull back on the pem studs, rotate or tilt the unit and then drop the stud into an index hole. This makes it a snap to change the position of the base, but once it is locked into place it will stay there no matter how much vibration. It’s made from 10 gauge steel, powder coated black. Boaters are asking for this in stainless, so that is available on demand. These can be permanently or magnetically mounted. The steeper the mounting surface, the more useful this is. You can mount the light on a 45 degree downward slope, and then use the base to bring it level. You can even mount the light facing down and then use the base to bring it level. Available in permanent mount or magnetic mount versions. 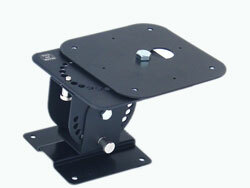 Excellent solution for mounting on garages and buildings. When combined with the GL-1204 Ac/DC Converter, any Golight remote controlled spotlight can be used with common house wiring (110 VAC). Thus, this becomes and excellent security light for driveways, walkways, etc. where people can use the handheld remote to activate and control the light as they approach and use the driveway, walkway, parking lot, etc.